At school Ian Berry was known as the art one. But around aged 18, he didn’t turn up for his art foundation course and listening to those who said art wasn’t a way to make a living (something he now campaigns against when lecturing at schools and universities), went to uni to study graphic design, before working in advertising in London and Sydney. ‘While I’m terrible at advertising myself, it enabled me to think differently,’ he says. 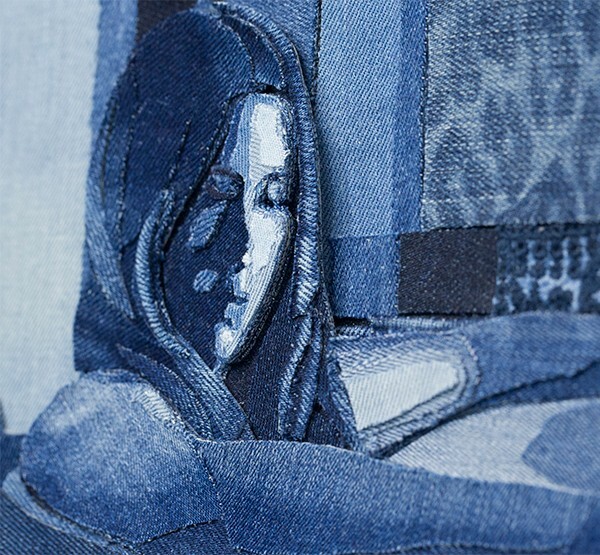 Berry has now been working as an artist for 12 years, creating works that at first glance, could be mistaken for drawings or paintings, but are actually crafted from recycled jeans. He tells us all about his life in denim. It was back at uni. One Easter, I went back to my childhood home. My mum had emptied some of my cupboards and among other things was a pile of my own jeans. I saw all the shades contrasting against one another and remembered all the times I had worn them – they don’t fit now! I had just created portraits of Tony Blair and Gordon Brown out of newspaper and thought I could try and do the same with the different shades of denim. l started doing portraits of people who were connected to the history of denim – Marilyn Monroe, James Dean, Marlon Brando, Debbie Harry. In the context of advertising, I thought it was amazing what these icons did for changing the perception of denim, from workwear to fashion. 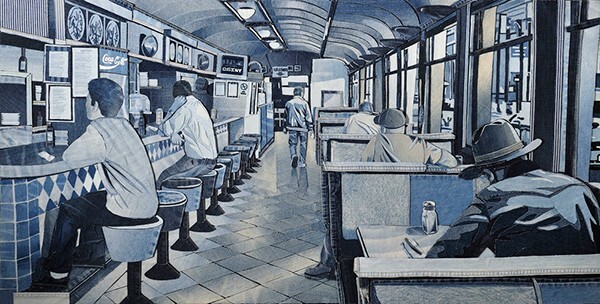 I loved the way denim followed the history of pop culture and the modern world. I became aware of my own connection to the material, as well as other people’s around the world. 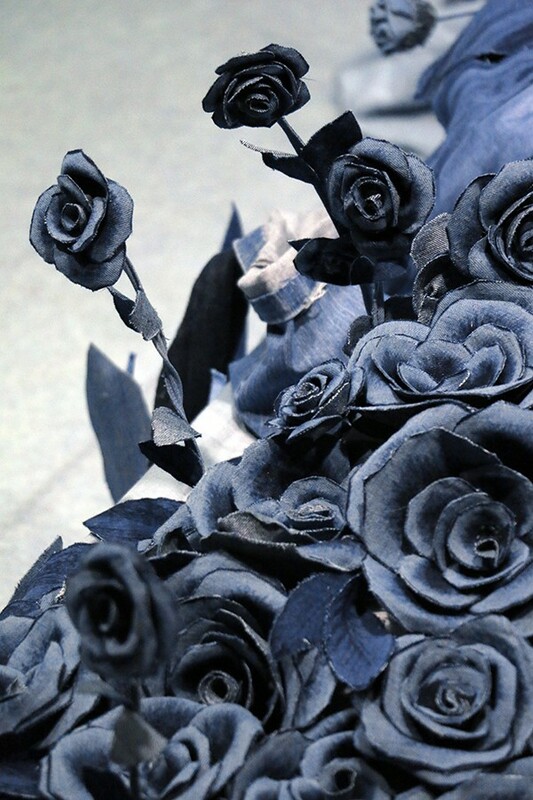 Denim has dualities, both good and bad. 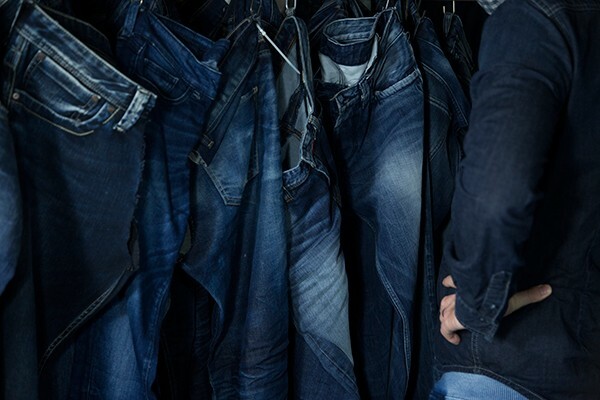 It has a democratic and universal appeal but when you wear jeans, it becomes individual. There is also the history of sweatshops, with cheap production happening in countries where pollution and work practices are not great. Denim is a perfect symbol for our modern world, sometimes sadly. 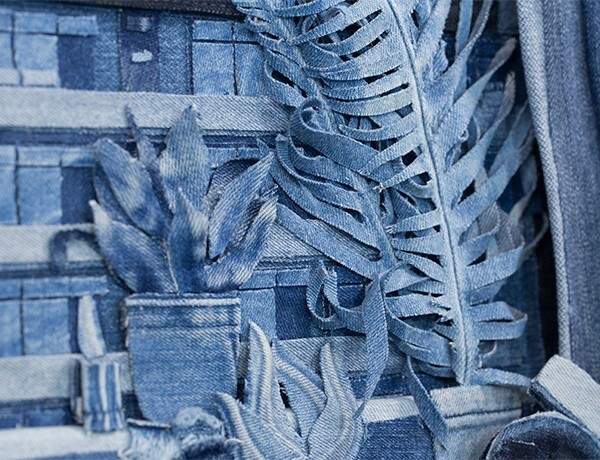 What is it about denim that enables you to best illustrate what you want to say? 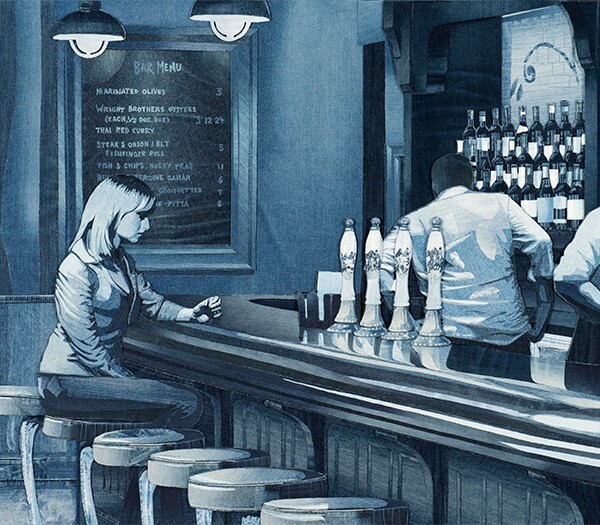 In my work, I portray contemporary life. What better medium is there than using the material of our time? 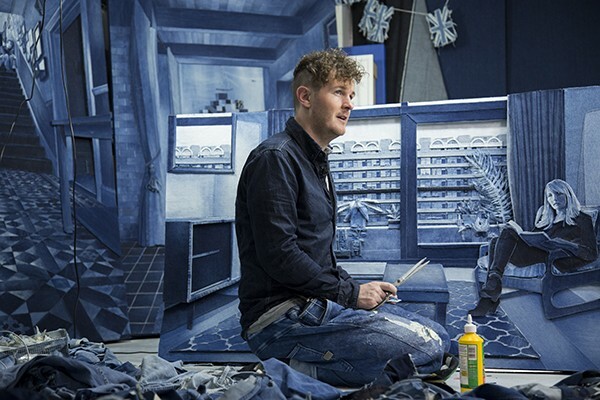 In truth, most don’t realise my work is made of denim. 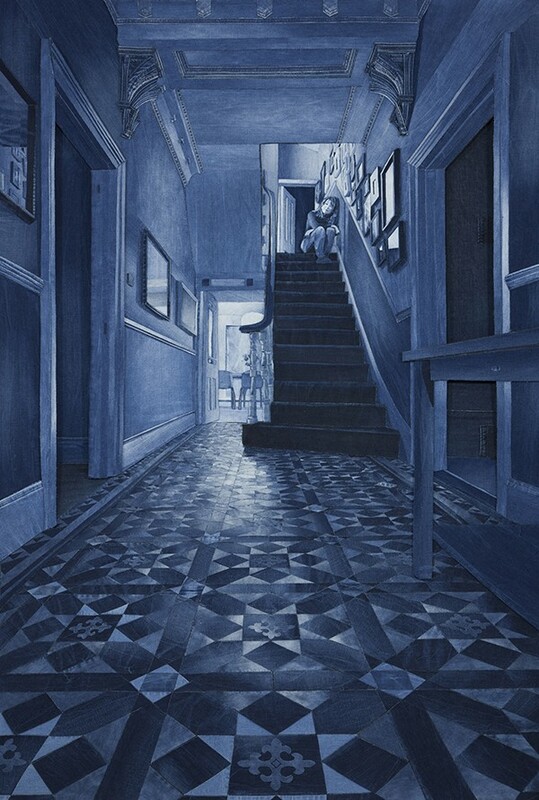 I use the denim like a painter uses paint and try to make them like photo-realistic paintings with light and shade, using washes of indigo on the denim as the direction of the brush. But my work isn’t all about it being in denim. I only feel like an artist when they see the real thing, it is very different from how they are seen online. I love creating depth in the layers of denim. 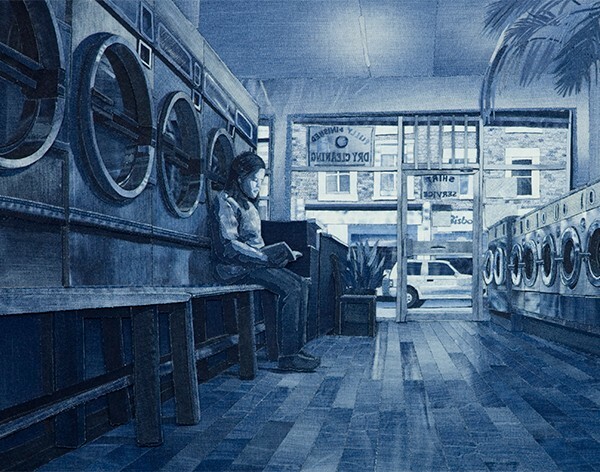 The Launderette piece had 15 layers of denim, just on the washing machine door. That gets lost online, as does the texture of the denim. 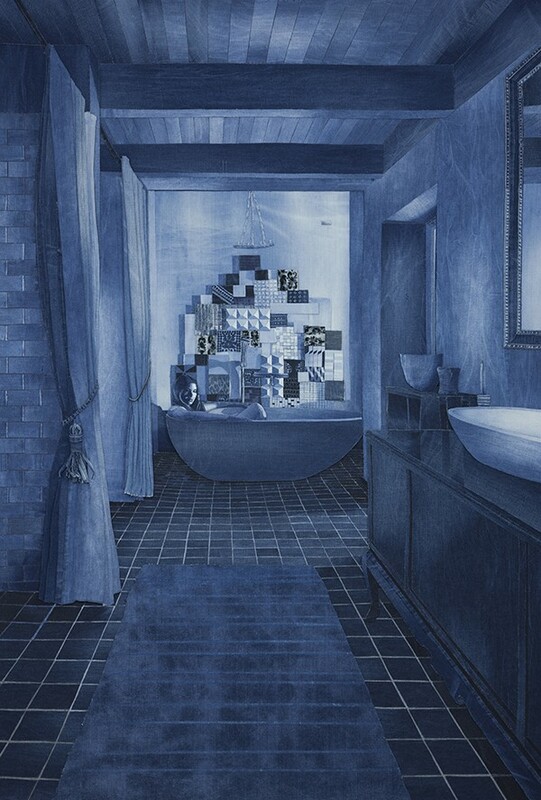 But I believe there is also something inviting in the denim, even if people don’t realise it’s denim to start with – instead thinking they are indigo toned paintings. I create everyday scenes out of a common material, two things people see often, but together become something very different. I often hear the comment, ‘I don’t often like art, but I like this’. I don’t know if that is a good thing or not, but really I want to reach people who usually think art isn’t for them. I recently had this happen and it was the most heartwarming experience. Is there an environmental side to your work? There are those in the denim industry who are authentic and then there are those who use terms like ‘sustainable’ and ‘eco friendly’ for purely marketing means. It’s the latest buzz word and while that could be celebrated, for many it is about profit and the bottom line. I love Blackhorse Lane in London and Ateliers de Nîmes in Nimes, France. They are really good people making denim in a more ethical way. I believe in small batch production and offering repair services – even if it means I get less jean donations! What can you tell us about the process of creating a work of art? There are three strands to my work – wall art/paintings, portraits and installations. With the everyday scenes, I take photos. If it’s not a scene I have stumbled upon and photographed, I will set it up with the appropriate lighting. With the portraits, I also work from a photograph. The better the original photograph, the better the piece, but I will also add more dramatic light. I love the challenge of making a shiny work surface, a metallic subway car or a reflection in a window. Whilst literally sitting in my pallet of jeans, all specifically chosen for the piece, I work from the photograph. I then try and blend each piece and layer them into one another. 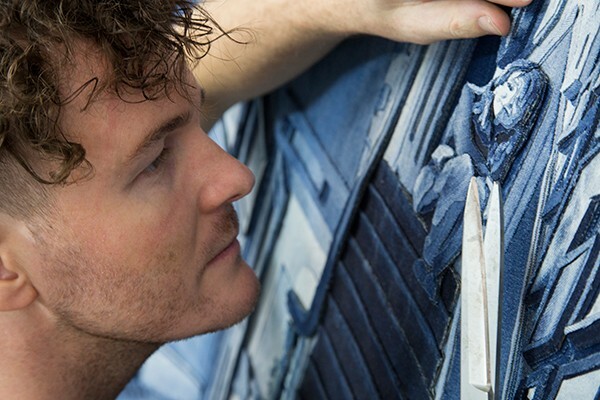 I work on a stretched denim ‘canvas’ mounted on a board – it stretches if not supported, and with sharp scissors, glue and my hands, I create the pieces out of thousands of cut pieces of jeans. The installations work rather differently. Sometimes they are made to display my work. In installations like ‘The Garden’, I used some laser technology. The whole trellis was laser cut, and parts were etched in laser (burned) to create effects and shades. I also work with an Italian company called Tonello that make sustainable washing machines and tools for the denim industry. How do you choose subjects for a piece and where do you find inspiration? While some may see a varied body of work, most don’t realise my work is about community – or lack of it. It’s an overarching theme about the changing fabric of our urban environment – the areas that are changing, gentrification and the materialistic life we lead. It’s about the lack of what historically were social gathering places, like the pubs that close down, the launderettes and the anti social ways we live. ‘Behind Closed Doors’ was the flip side of that, where it showed people alone, but alone in a perfect home – a house, not a home. It looks like an Elle Decoration double page spread, but while the person may have an expensive house, they also have a big mortgage and a partner having to work non stop to pay for it, leaving one alone, with everything, but with nothing. My inspiration comes mainly from London and cities I know across the USA. I love the layers and depth of history in cities. 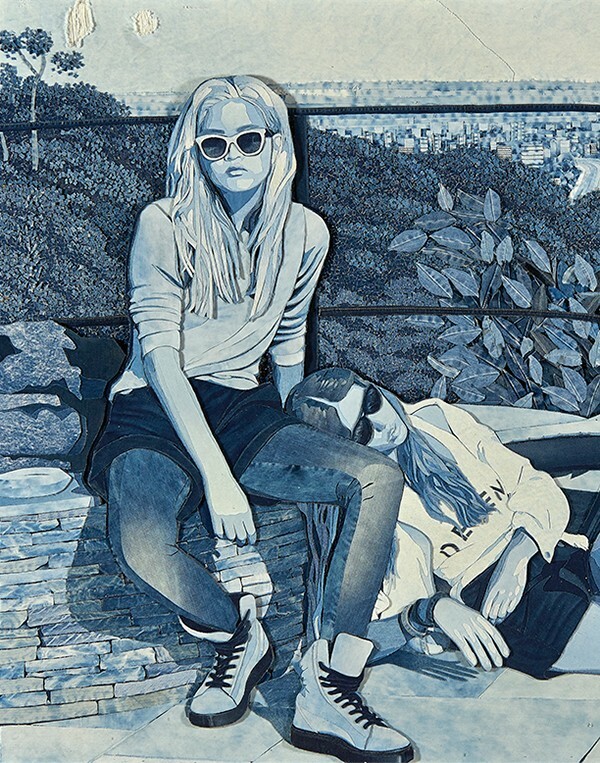 And what was once very rural, denim is now a very urban fabric. Are there any other artists that have inspired your work? I think the biggest inspiration to get back in to art was what was going on in the early 2000’s with street art. It was the attitude of ‘I’m just going to do this ‘cos I want to’. A childhood hero was David Hockney, who came from Bradford, neighbouring my Huddersfield. I remember seeing his work in Saltaire as a 12-year-old and being amazed at his work in Los Angeles, thinking wow this person comes from my area. He still works every day and his ethos is inspiring in today’s art world. Mark Evans‘ work with leather blows my mind. Max Zorn creates stunning work out of brown packing tape, where he builds up the layers and puts it on a light box. 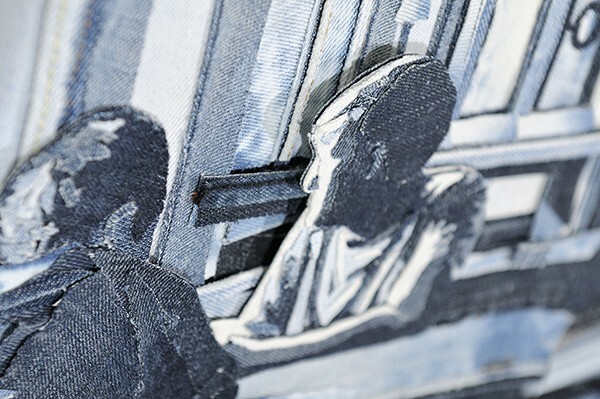 Other friends that work with denim are Holly Brown who prints on to it and Juan Manuel Gomez who worked in a laundry in Columbia and uses dyes and washing techniques on denim. Where do you source the old jeans from? First it was my denim, then my friends’ denim, then their friends, then neighbours would leave bags outside. Then it was scouring charity stores, vintage shops, as well as sometimes buying pairs of denim new in a shop if it had a good wash.
Now I get many from denim brands and mills. They are mainly samples – cut or damaged so couldn’t be worn and would only be thrown away. It means I get many of the same pairs, so it’s like working with a big pot of paint rather than a small tube. I have about 2000 pairs of jeans and they are all set out in my East London studio like a big pallet, organised into shades. What interesting collaborations have you worked on so far? I prefer working on my own work unless it is a commission that really interests me. Commissions turn into a lot more work than you first think, and in that time I could make several pieces of my own work, instead of just one. I get many offers but only take about 1% of those jobs. A lot of those come from the denim industry. I want to keep my work as art and many denim companies just see it as a means of advertising. We have to align and it has to be for the right reasons. 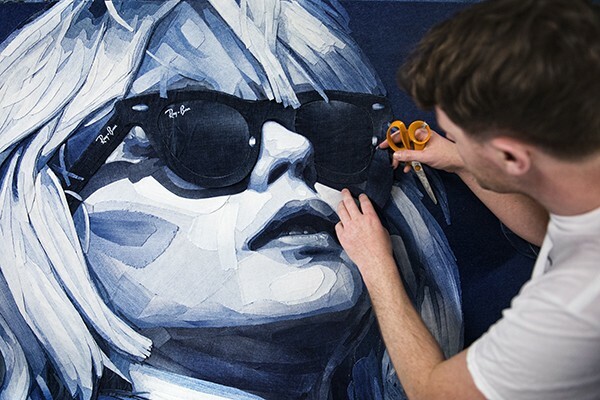 I did work with Ray Ban on their Denim Wayfarer a few years ago where I made a portrait of Debbie Harry. I love the CBGB scene and all the bands from that time, many of which played a massive part in the denim story. I became friends with some of the guys in Blondie and made Tommy Kessler’s jacket (my work cant be washed and five years on he’s still wearing it!) 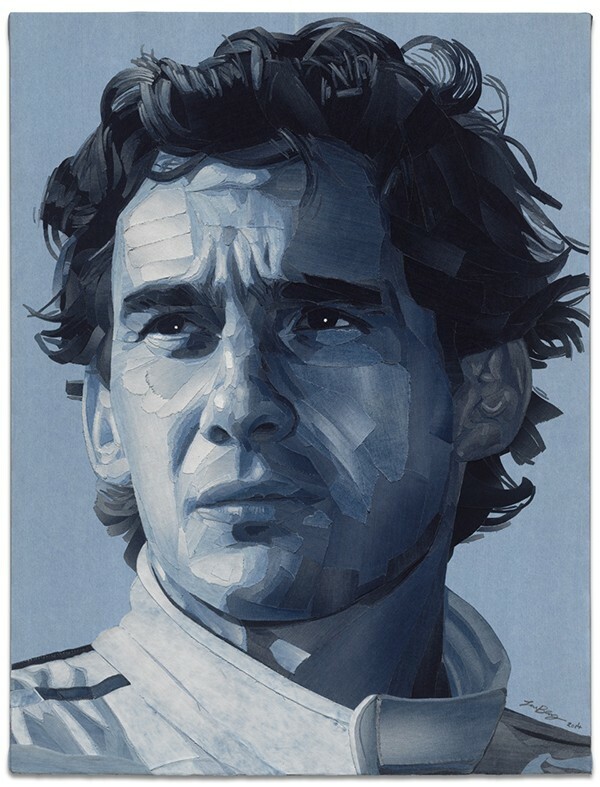 I’ve also done portraits of Giorgio Armani, Lapo Elkann, Ayrton Senna and have been commissioned to do a number of magazine covers. What was the last thing you worked on? I have just got back from an artist in residence in Labastide-Rouairoux, France, a town known for its textile history. I showed a piece called Secret Garden, and the community helped me to install it. It was a brilliant experience that brought a whole town together and I received their rare Medal of Honour. To see what people do to try and keep their town alive (most of the textile industry has left) is inspiring. I finally got to go to nearby Nimes, where the word ‘denim’ derives (Serge de Nimes). It was an amazing experience culminating in a visit to the textile museum, where I saw a poster for a factory, it was from Huddersfield, to my shock it was my grandad’s factory which made me realise my own textile past. For the residency I actually put up a second installation in a old factory. 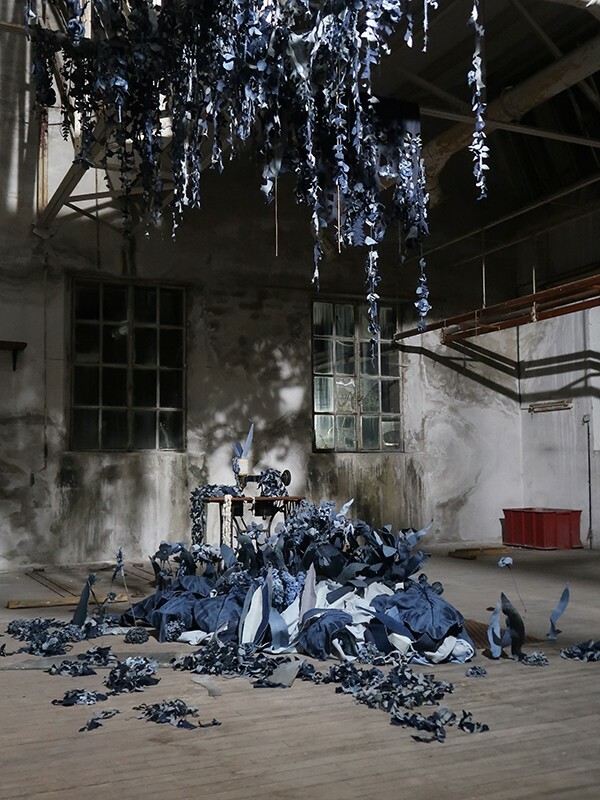 It was made to look like nature – denim vines and plants had broken in to take over. Coming from a textile area in Yorkshire and seeing the effect of the decline in textiles, it is quite depressing seeing communities being ripped apart from their history and livelihood. Times do change, but soon this history and authentic heritage will be lost. And for what? A world of throwaway mass produced cheap goods. 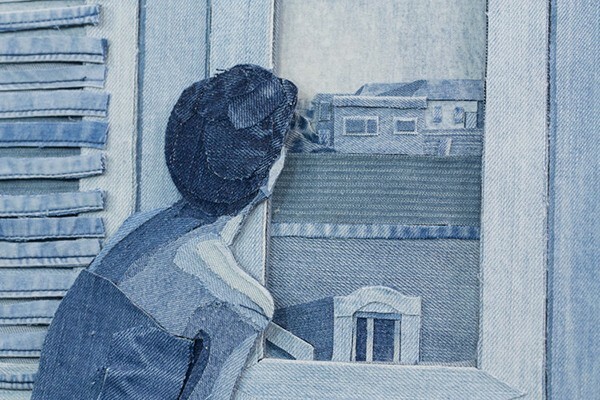 I will be opening up a show at the Smallest Gallery in Soho, where I will make a whole record store out of denim. Soho was famed for music, but many of the vinyl record stores have shut up shop. The piece will pay homage to the area and its history, but also the many bands that had an impact on the story of denim. In December, I’ll show at Art Basel in Miami at an old dive bar in South Beach. I will be unveiling a big installation in San Francisco. My next solo will be at the end of March 2019 in London. All I want is for people to see my work in real life… the rest will be is easy and will work out.